I want to say right from the beginning that I don’t have an agenda. I was very reluctant to write this post. My blog is normally about development, not about ranting, but I have an issue that no one else seemed to be having with the new iPhone 5. I am not a fan boy or hater of any smart phone platform. I own an Apple iPhone 4, a Google Nexus One (Android), and a Samsung Focus Flash (Windows Phone 7). I like and dislike things with all of them. When AT&T, my carrier, announced that it would allow those of us who have the grandfathered unlimited data plan to keep it with higher data speed iPhone 5, I decided to buy one and I now regret that decision. My first iPhone 5 arrived on the afternoon of September 21st. Once I got home, I got the phone up and running in a short amount of time. Backing your data to the iCloud works well. The phone worked great over the weekend. I tried to turned the phone on, but it would not turn on. Roughly thirty minutes to an hour later the phone came on by itself. Everything seemed OK except it no longer had a cellular signal. 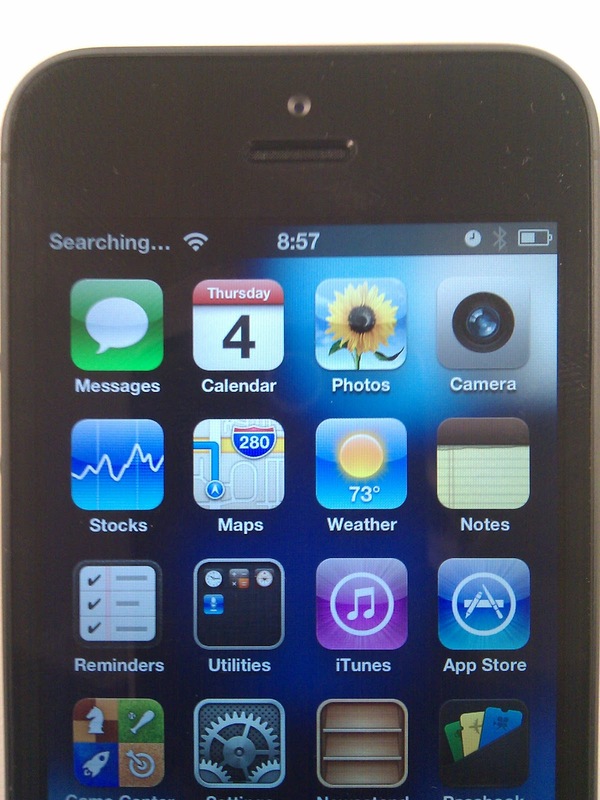 Instead of “AT&T” in the status bar, there was the message, “Searching…”. I let the phone sit like that for about an hour before I turned it off and popped the SIM card out. My team at work was close to a major production deployment of our website and I didn’t need any distractions. After our deployment, I began to make an appointment for the Genius Bar at a Apple store near my work. On that site it gave me some suggestions of how to resolve the issue myself. When I tried to re-install iOS 6 onto the phone, the installation failed with an error code of “-1”. Now my phone was completely useless. I made the appointment to speak with a Genius. When I arrived that Apple store a few minutes ahead of my appointment it was crowded. After checking in, I waited. My appointment was for 3:50 and by 3:53 a Genius was calling my name. The Genius was unable to fix my phone however. When he tried to install iOS 6, it failed for him too. I braced myself to be told something unpleasant, but the Genius walked over to a drawer, opened it, grabbed a brand new phone. He typed some information into his computer then asked for the SIM card. I popped the SIM card out of my Windows Phone 7 and he popped it into the new iPhone 5. After following the activation steps, I was in business again. Unfortunately this story doesn’t have a happy ending yet. This morning, October 4th, I went for a run again. Once again listening to music over bluetooth on my iPhone 5. When I passed the nine minute mark still listening to music, I smiled, but it wouldn’t last. At the 17 minute mark, the phone crashed exactly as it had before. Roughly 30 minutes later it rebooted on its own and once again the message, “Searching…” appeared at the top of the status bar. I can no longer make phone calls. I know at least half a dozen people who have iPhone 5s, none of them are having any issues and they are all happy with it. I, unfortunately, am very unhappy. I have made another appointment to speak with a Genius at the Apple store. I will probably call AT&T this evening to see about returning the phone and getting my money back. The end result of my trip to the Apple store was iPhone 5, number 3. The Genius, Mike, was super cool and seemed very knowledgeable but was mystified as to why my phone couldn’t get out of search mode. He tried several things including reseting the network connection, but nothing work. He did posit a theory that there may be a bad file in my cloud backup, which I used when activating both previous phones. Activating it as a new phone isn’t really that much of a hassle since I have all of my contact information in my Google account and I don’t have that many apps installed. I still don’t have music on the phone so I ran with my Windows Phone. Besides I am too gun shy to try it. Sometime after code camp, when I have my music back on the phone and time for a possible trip to the Apple store, I will try running with it again. Hey…this is a amazing blog friend and an useful post!!! i am new here and i discovered this website very exciting. thanks for share it with us.